This manuscript is not available. This edition will be available at UNM Libraries soon. This is the uncorrected proof/advance reading copy of The Wailing Wind. This copy was distributed to generate advance press prior to the first edition being subsequently published in 2002 by HarperCollins. The front cover of the proof copy contains the original artwork by Peter Thorpe of a Yei figure overlaid on a geometric shape containing a desert landscape in the background. The cover background is brown, and the author name is printed above the figure in dark blue with the name of the novel in off white just below. 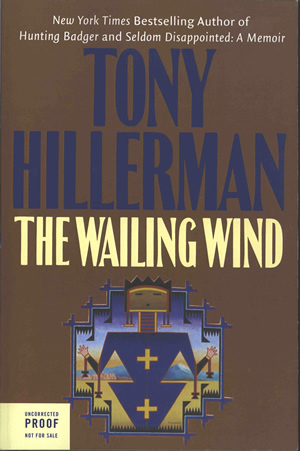 The back cover is pale yellow and contains a synopsis of the novel, a one-paragraph biography of Tony Hillerman, overview of the planned marketing for the novel, and publication information. The publisher's imprint is at the bottom printed in white on a dark purple background. Binding: Full-color paper covers. The author name, book title, miniature version of front cover illustration, and publisher's imprint are printed on the spine.